Home has ample parking & near Allen Harbor for boats & kayaks. Walk to Wah Wah Taysee Beach or other nearby Sound beaches. Open floor plan LR, kitchen/eat-in area/breakfast bar and DR. Living Room with cathedral ceiling, FP, stereo and cable HDTV. Dining room with sliders to the outdoor deck. 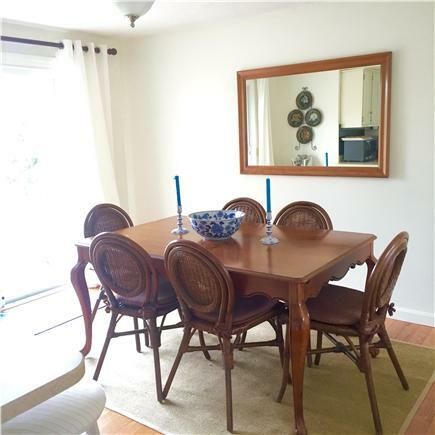 Well appointed cottage eat-in Kitchen with breakfast/coffee bar. Private, fenced-in back with shower, firepit, gas grill, seating. Relax Queen Bedroom on Upper Level with large dresser and closet. 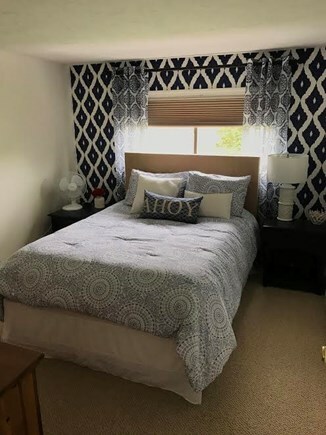 Ahoy Queen Bedroom on upper level with large dresser and closet. 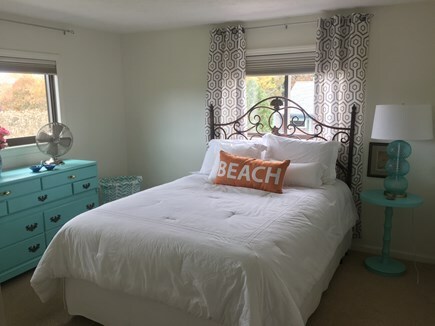 Beach Queen Bedroom on upper level with large dresser and closet. Two Full Bathrooms on upper/lower - Tub/Shower & Stand-up Shower. Family room on lower level with Queen Sleeper Sofa & cable HDTV. Welcome Twin Bedroom on lower level with dresser and closet. Plan your Summer Getaway! 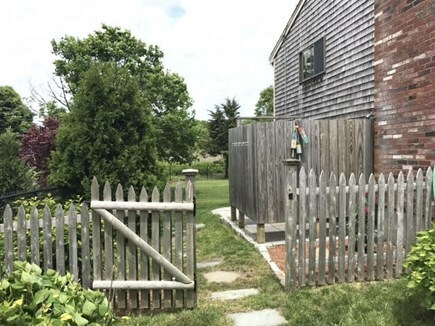 Stay in a cozy Cape Cod house with a child-friendly, quiet backyard located on Lower County Road within walking distance to two private Nantucket Sound beaches: Wah Wah Taysee and Wyndemere Bluffs. It's also a great place to drop a kayak across the street in Allen's Harbor and head out to the Sound. 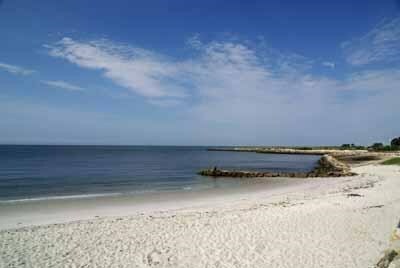 After a day at the beach relax and enjoy the peaceful back yard and consider a walk to the village for $1 Oyster Happy Hour at The Port or any number of lunch/dinner restaurants, shopping and entertainment. The house is open and airy with a freshly painted interior, new mattresses, central AC and an open floor plan for maximum interaction between living room, fully-equipped kitchen/eat-in area and dining room. You'll find a large, separate living area downstairs with a family room, twin bedroom, full bathroom and a laundry area. We provide beach chairs, beach umbrellas, coolers, a wagon and a kayak with cart. Linens service is available at an additional cost, if needed. Additional availability info: Partial weeks considered or some flexibility with dates - please inquire. This is a Saturday to Saturday vacation rental. Long-Term Rental (1 month or more): House is available for winter monthly rental October - May. Perfect accommodation for employers seeking to house their employees while constructing on the Cape in the off-season! Great house, great yard, awesome location. Just right for our family of 8 Kids were so happy!! Great owners, available if necessary but otherwise just offered a carefree great vacation! The wedding week was wonderful. We loved your home. It was perfect. Well stocked and very comfortable ( although my son and wife were unable to sit on feather filled couches). Thanks with your prompt assistance with the keys upon arrival. My husband and I rented this house for the week leading up to our son's wedding in Harwichport. Prior to arrival we were able to have much communication with the owners. Every ques. was answered and everything was as described. We had a fab week - plenty of room inside and outside. My grandchildren loved playing in the fenced-in back yard while the adults 'played' on the deck! The outdoor shower is a treat as well as the fire pit - s'mores at night were always a hit. The beach is a 5-minute walk, and there's no place to park there, so it's never over-crowded. We also enjoyed walking to town for breakfast or dinner - everyone is so friendly in Harwich Port! What a lovely home that suited our needs spectacularly. 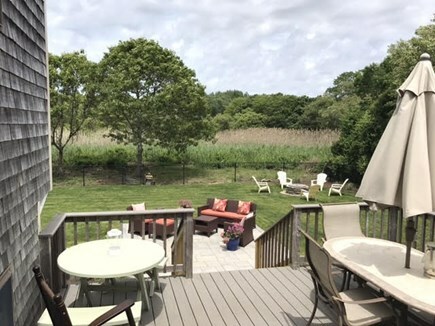 I grew up in Harwich and needed a place for family to stay for a family reunion. It was wonderful to see my 'old stomping grounds' again. The house is more than suitable in a great location and has some great renovations done to it. The new landscaping in the backyard gives it a resort feel to it, and its location is perfect for walking to the beach or the center of town. Worth every penny! Great Experience! 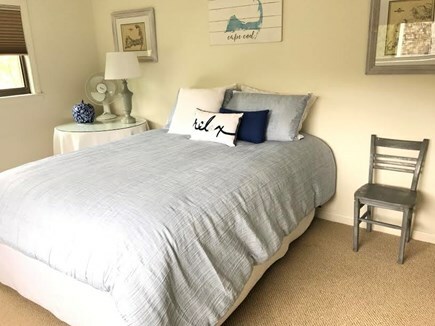 Nicely decorated, comfortable beds, and CLEAN - no musty house smell you can get on the Cape sometimes! Would definitely rent again! I was a little worried about the house being on a main road - but it wasn't an issue at all. With central air there was no need to open the front windows, so we could not hear the street noise at all. When we were on the back deck and in the yard, you can't hear the cars either. Owner was charming and helpful! You went above and beyond being helpful while we worked through some kinks with being the new owners of a home and working out the kinks with the air conditioning. I can't thank you enough for taking such care of the property and hope to have you again! This Fall will bring some updates to the home which we will reveal on the website!